As mentioned yesterday, I’m trying my best to make this Queenstown trip holiday rather than a wine tour. Today was all about wine, however, with visits to Amisfield, Peregrine, Gibbston Valley, Carrick and Mt Difficulty. 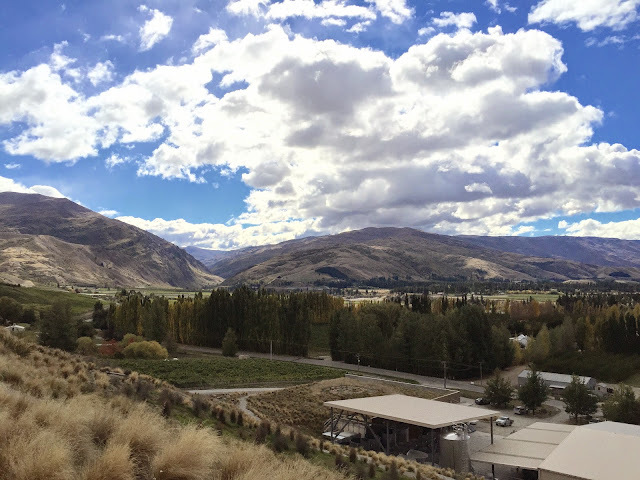 – Pinot Gris continues to put in a claim as Central Otago’s premium white variety. If the alcohol doesn’t stick out, and the acidity is well handled, good, ripe, textural Pinot Gris is a regional go-to. Special mention to Amisfield’s full flavoured ’14 Pinot Gris for nailing it. – Some of the ’12 Pinots look quite awkward. A late, mixed season (with November snow and late vintage heat) means that wines can look a little lumpy, especially next to the more open and juicy ’13s. Carrick’s structured 2012 Bannockburn Pinot Noir looked the pick of the ’12s today, as did the pricey, but cleverly made, ’12 Mt Difficulty Long Gully Pinot. – Riesling looks like a hard slog. Just getting the sweetness balance right seems hard enough, with the driest wines underwhelmed the most. Many producers seem to be pouring older vintages, so looks like consumers don’t seem to be buying them either. I'm here with my family and they actually have a pretty high tolerance to days spent in vineyards and wineries which is so good. Now, firm recommendation for Dart River jet boats, bar at Eichardts hotel (good local beers too) and I thought Carrick cellar door a highlight for wine and range available.